HIT: "Black Panther": On a budget of $210 million, Ryan Coogler's superhero film — the first to feature a predominantly black cast — grossed more than $700 million domestically (third highest all-time, not accounting for inflation) and $1.3 billion worldwide. It became the first movie to top the weekend box office five times in a row since "Avatar." 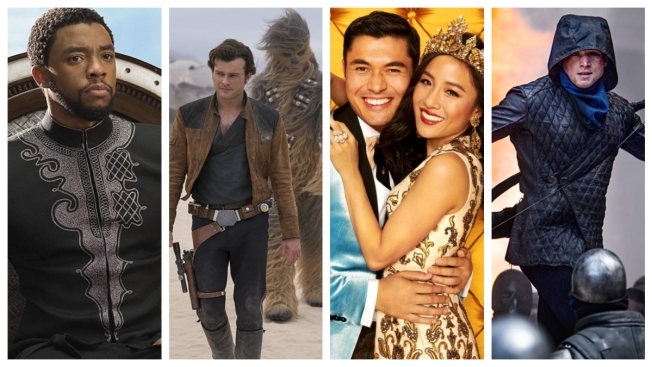 MISS: "Solo: A Star Wars Story": Not everything Disney did in 2018 was perfect; "The Nutcracker and the Four Realms" and "A Wrinkle in Time" also fizzled. But few disappointments were more acutely felt than the extensively retooled Han Solo spinoff directed by Ron Howard after original directors Phil Lord and Christopher Miller were jettisoned. On a production budget of at least $250 million, the heavily promoted spinoff grossed $392.9 million worldwide. It did worse than every previous "Star Wars" film, and the negative reaction from fans and critics forced Disney to reconsider its future plans for the franchise. HIT: "A Quiet Place": With just a $17 million budget, John Krasinski's horror thriller grossed $340.7 million worldwide. The Paramount Pictures release was the biggest original hit of a year typically dominated by sequels, superheroes and reboots. Of course, "A Quiet Place" will get its own sequel, slated for release in 2020. MISS: "Mortal Engines": One of the year's worst bombs arrived just as 2018 was coming to a close. The Peter Jackson-produced $100 million fantasy, from Universal, opened with a mere $7.5 million last weekend. Young Adult fantasies aren't selling like they used to, especially when they come with big budgets and a 27 percent fresh rating on Rotten Tomatoes. HIT: "Crazy Rich Asians": Rom-coms have for years been largely absent from theaters, but the Warner Bros. adaption of the best-selling novel grossed $238 million worldwide on a $30 million budget. As the first studio release in 25 years to feature a predominantly Asian-American cast, it was another example of how diversity sells at the box office. MISS: "The Happytime Murders": Who could have foreseen that an R-rated puppet comedy would disappoint? The STX Entertainment release starred one of the most bankable stars in comedy, Melissa McCarthy, but it has managed only $27.5 million worldwide on a $40 million budget. HIT: "Incredibles 2": Success is usually expected of Pixar; all but one of their 20 releases has opened No. 1 (and the one that didn't, "Inside Out," grossed $857.6 million globally). But even by their high standards, Brad Bird's "Incredibles" sequel was a massive hit. With $1.24 billion in worldwide sales from a $200 million budget, "Incredibles 2" ranks second behind only "Frozen" among animated movies in ticket sales. MISS: "Robin Hood": Just as audiences didn't want another "Girl in With the Dragoon Tattoo," they had little interest in more Robin Hood. The Taron Egerton-led return to Sherwood Forest, released by Lionsgate, cost $100 million to make but made out with just $72.9 million worldwide. HIT: "Halloween": Horror continued to dominate the box office — the "Conjuring" spinoff "The Nun" also ranked as one of the year's most lucrative hits. But Blumhouse's "Halloween" sequel, 40 years after the original, grossed $253.5 million worldwide on a budget of just $10 million. Starring Jamie Lee Curtis, 60, it now holds the record for best opening weekend for a film with a female lead over 55. MISS: "London Fields": It cost a modest $8 million to make, but the long-delayed Martin Amis adaptation starring Amber Heard was among the most widely ignored films of the year. After being held up for years by lawsuits, it opened with just $160,000 on 613 screens — a per-screen average of $262. It ranks as among the worst performing wide releases ever.